You don’t suffer through the quagmire of traffic or the logistical gymnastics of planning a share house to get to the Hamptons and NOT drink by the water, do you? 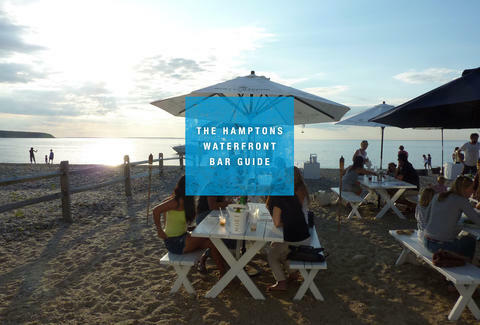 No you don’t, so for those of you without the logistical skills to snag a pool, here are 33 bars to drink at on the water in the Hamptons. Enjoy. 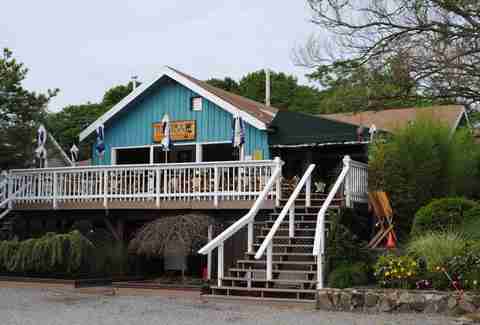 This restaurant & Tiki bar tucked into little-known East Moriches features a budget-friendly bar menu with most food and drink options priced at under $10. Dinner is served all day at this lobster mecca with live music every Monday & Friday and daily happy hour specials. This all-in-one destination combines a top-notch seafood restaurant, rooftop bar, and clam bar into the kind of mega eating/drinking destination we wish there were more of. Don’t be fooled by this upscale seafood destination -- it’s got a happening outdoor bar scene with live music, $5 cocktails, and appetizer specials on Fridays. 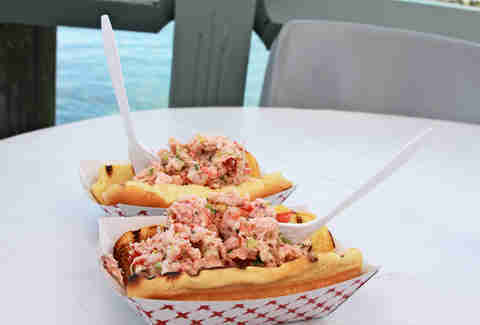 This historic BYOB joint serves up some of the best lobster in Montauk, plus it’s BYOB. Signature cocktails, quality seafood, live music, and a giant waterfront patio make this a top summer destination. 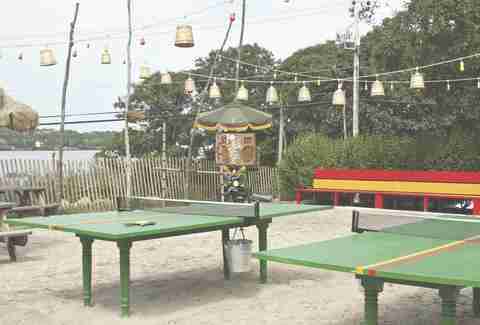 It’s technically located between Amagansett and Montauk, but for its extra-casual vibe, daily fish specials, and single wine selection (white, obviously), we’re claiming this spot to laid-back Montauk. 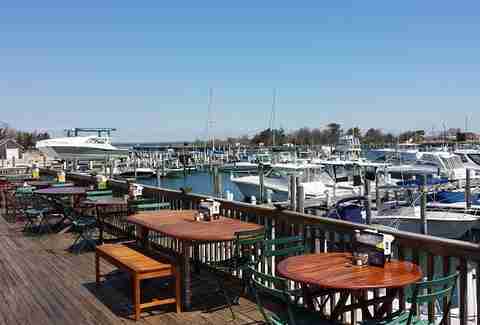 With locally sourced seafood and wine, weekend karaoke, and happy hour specials Monday to Friday, this casual-cool waterfront spot is a real-life mermaid short of being the Hamptons' best waterfront bar. This popular Montauk spot serves up strong cocktails like the Torpedo (rosé, gin, orange, peaches, soda), a reliable selection of summer beers, and tasty eats like crispy rock shrimp, all with beachfront views. Sunset views + live music + tons of outdoor seating + a bar menu with food & drink options you can rely on without breaking the bank = this might just be the perfect waterfront spot. 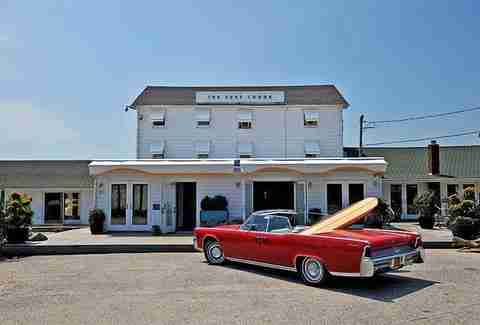 This popular boutique hotel’s restaurant has some of the best waterfront views in Montauk, with sustainable, local seafood caught right off the Long Island coast. Another bonus? Its summer concert series with top headliners like Stone Cold Fox and Solange Knowles. Sunset views, classic cocktails, and live music every Saturday to Tuesday make this the perfect low-key waterfront-ery to catch the breeze with a brew. 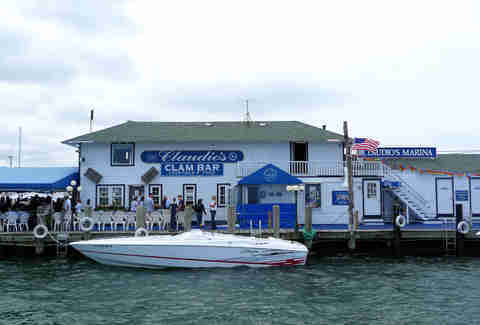 This Long Island institution (145 years in business!) is definitely more restaurant than bar, but with a mega seafood menu that has everything from lobster BLTs to stuffed flounder and panko-crusted crab cakes, we felt it needed your attention. Also, it’s still more than enough bar (see: seven types of Bloody Marys). Lobsters and brews are the name of the game at this casual waterfront joint. 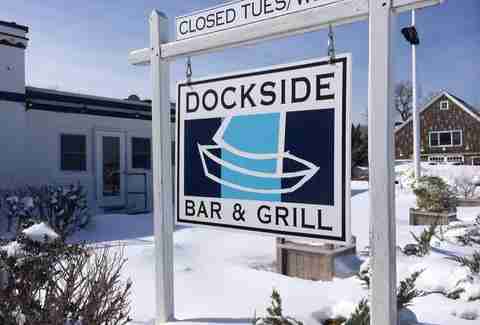 A classic waterfront joint with sizable outdoor seating and a full bar. 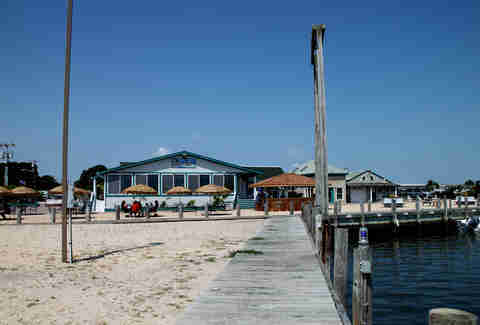 A Westhampton go-to, this bar & restaurant perched atop a pier serves up reliable eats and drinks in a fun, low-key setting. 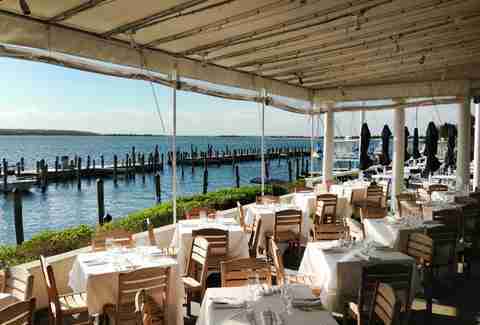 Set above the Sag Harbor Cove Yacht Club, this restaurant & bar features a large selection of beer, wine, and cocktails and plenty of alfresco seating. Plush seating abounds at this hotel bar with creative cocktails, specialty pizzas, and panoramic marina views. This nautically themed restaurant overlooking Three Mile Harbor is built around a full-size mahogany sloop named “The Jade,” which participated in five Olympic races before being preserved. And if that wasn’t enough to get you there, it's got a full bar and fantastic outdoor seating. Weekly live reggae music, margarita shrimp tacos, and a solid selection of brews? Yes, yes, and yes. With a daily happy hour special featuring $1 oysters and $5 glasses of rosé, is there really anything else you need to know? 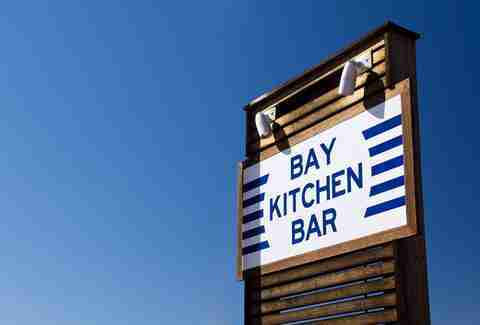 This casual seafood hub has outdoor seating in the sand (! ), a full bar, and fire pits for cooking up s’mores. This Caribbean-themed hideaway boasts tasty eats like duck empanadas and pulled rib tacos, live music every Thursday, and half-priced happy hour specials Monday to Friday. 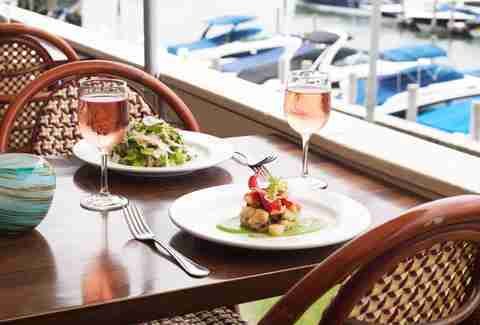 A casual seafood must, Westlake offers sunset views, live music, and a reliable bar in a low-key setting. 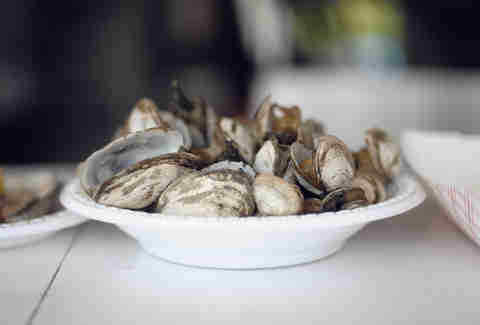 Seafood served on paper plates and $6 or less brews. 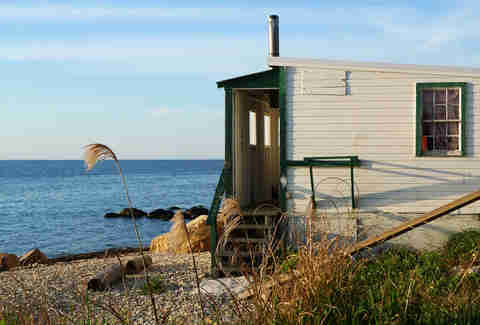 Hello, Hampton Bays staple. This literal hula hut on the beach is essentially a giant Tiki bar serving serious cocktails with regular live music. 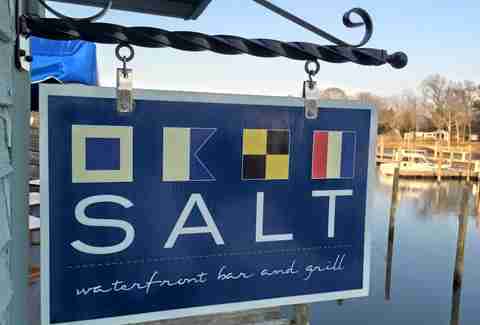 The name says it all at this waterfront joint serving fresh seafood and cocktails aplenty in a casual, nautically inspired setting. 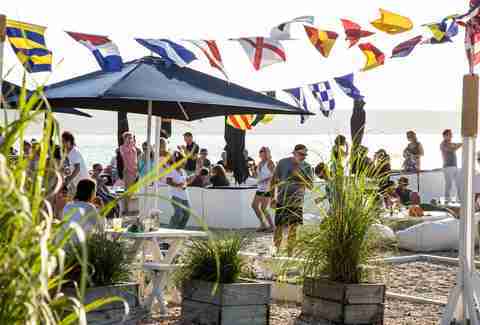 A Montauk institution and summer rite of passage, this king of summer bars brings the waterfront frat life to, uh, life. A cash-only bar, The Dock explicitly bans strollers, screaming kids, cellphones, and dirt bags, which makes it exactly the kind of place we want to be. This ultimate dive bar has cheap beers ($1 drafts... seriously), lots of locals, and marina views. 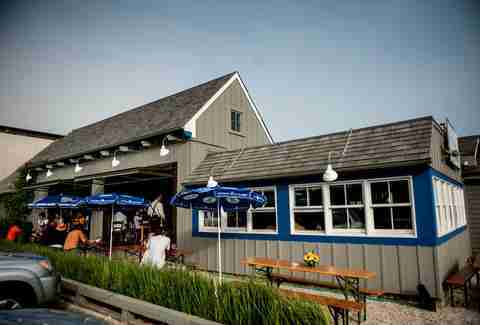 A waterfront bierhaus serving authentic German brews & food, you can’t go wrong at this casual outpost with sporting event specials and live music all summer long. You know the hotel, you know the bar, and you know that unmistakable Ruschmeyer’s hangover. 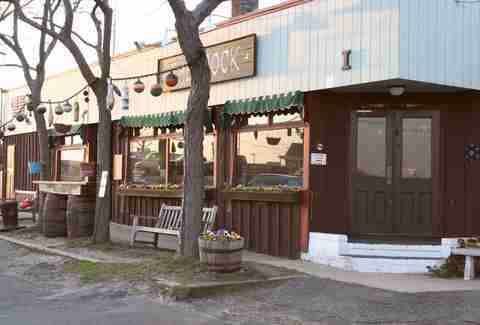 But this classic Montauk hub has a killer restaurant too, and with weekend brunch, Sunday boils, and a full bar -- it deserves your full attention.